Secular Pro-Life Perspectives: Unplanned in Theaters Today! 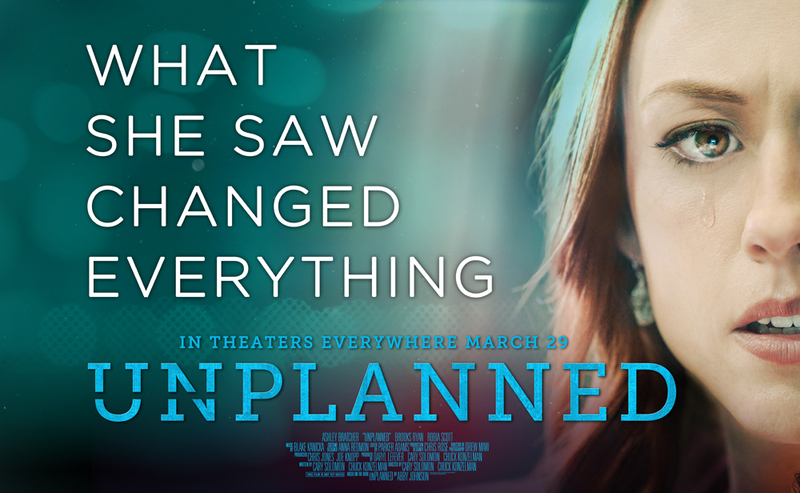 Unplanned, the film based on Abby Johnson's memoir of the same name, hits theaters tonight. Abby was once a local Planned Parenthood director; today, she is a vocal pro-life advocate and the head of And Then There Were None, which helps abortion workers leave the industry. Such a dramatic turnaround makes great raw material for a script—and now, nearly ten years after Abby's life-changing departure from Planned Parenthood, her story is finally coming to the big screen. Maria Oswalt, Rehumanize International: "It is one of the most frank and realistic pro-life movies I've ever seen. It spares no details in its truthful retelling of Johnson's journey, and in my opinion, it fairly represents the motivations that lead people to work in the abortion industry — which is extremely important for pro-life activists to understand if they hope to convince pro-choicers to switch sides. It's an intense, poignant, must-see for anyone involved in the pro-life movement." Rachel Crawford, Equal Rights Institute: "This film takes abortion from being an abstract idea and puts it in a concrete situation. The reality of abortion is not pretty, but it is important to understand." Terry Schilling, The Federalist: "All in all, Unplanned is a very persuasive movie. It’s not enjoyable in the traditional sense—it’s an emotional rollercoaster that will upset you repeatedly—but it is an incredibly powerful film that deliberately seeks a dialogue with people outside of the pro-life movement. This is what makes it so valuable and so important. Go see it this weekend, but don’t just go by yourself. Take your family. Take your friends. Heck, take your accountant. No more euphemisms. No more ignoring the issue. It’s time for us all to see what abortion really is." The movie is rated R for its accurate portrayal of the violence of abortion. Secular viewers should also be aware that there will be Christian content—but I hope that doesn't dissuade you from giving the movie a chance. This is Abby's personal story. From reading her memoir, I can tell you that Abby's Christian faith has a significant impact on her journey. Erasing that aspect of her story would make the film inauthentic. So go see it, and see it as soon as you can. Opening weekend statistics are critical. Producers and writers are paying attention. A strong showing will demonstrate that pro-life audiences are hungry for films that expose abortion for the violation of human rights that it is. A full list of theaters carrying Unplanned can be found here. Baby Chris was conceived today! Help Us Get to the Pro-Life Women's Conference! Whose Body Is It, Anyway?